Hike past the Bioniassay glacier and the rolling slopes of Col du Tricot (if weather permits,) afterwards descend into the Valley of Les Contamines-Montjoie. Then climb up along an old Roman ridge and past an original Roman bridge. Arrive to the Gîte in a valley that leads to the Col du Bonhomme and stop for the night for a well-deserved rest. Approximate hiking time is 8.5hrs. 900m - 2952ft ascent, 1300m - 4265ft descent. Begin the steep ascent to the Col Du Bonhomme, then hike to the Croix du Bonhomme and stop for lunch. While eating your meal, enjoy the amazing view of the Vallee des Chapieux. Descend to Les Chapieux for the night. Today the group will tackle steep uphill and downhill routes on rough terrain, this part of the tour can be extremely difficult but hikers’ feeling of satisfaction after climbing the Col du Bonhomme make the challenges worthwhile. Approximate hiking time is 7 hours. 1300m - 4265ft ascent, 900m - 2952ft descent. Climb through open pastures and snowfield to Col de la Seigne and the border with Italy. Pass by picturesque glacier lakes while descending into beautiful Val Veny. Continue on a 45 minute descent to Rifugio Elisabetta, then a further 45 minute descent will bring the group to La Visaille. From this small hamlet take a bus or taxi to the picturesque town of Courmayeur, Italy. Approximate hiking time is 5hrs. 750m - 2460ft ascent, 800m - 2625ft descent. Free time to explore what the biggest town in the Italian Mont Blanc circuit has to offer such as restaurants and bistros. Enjoy a magnificent cable car ride to Pointe Helbronner and back - the views are stunning. Raft down the scenic Dora Baltea River in the Aosta Valley. Hop on a bike and enjoy the challenging ride, with some steep inclines and spectacular views. Get to know this charming bilingual city nestled in the Italian Alps. It offers many sights to explore, including the ancient town walls of Augusta Prætoria Salassorum, still preserved almost in their entirety, and an ancient Roman amphitheatre. Lace those hiking boots back up! Start the steep climb up to Rifugio Bertone with the best view of the Mont Blanc Massif. Hike along the Mont de la Saxe, taking the balcony path facing the ridge of the Grandes Jorasses. Stop for a picnic lunch and take in the unforgettable view. Continue to Rifugio Bonatti, overlooking the Italian Val Ferret for the night. Approximate hiking time is 5hrs. 850m - 2789ft ascent, 700m - 2297ft descent. Start towards Arp Nouva, then begin the steep climb across the Grand Col Ferret, and descend into the hamlet of Ferret, Switzerland. Continue the decent into the Alpage at La Peule before reaching a high traverse above the valley; from here, enjoy the view of the deep, green forest crawling up the foothills of the surrounding mountains. Continue downward on a the final passage, finishing in the mountain village of La Fouly, where you can finally kick those feet up and relax. Approximate hiking duration is 6hrs. 900m - 2953ft ascent, 1400m - 4593ft descent. Taking the Bovine Way, an old trail used to access the flower-filled summer cow pastures high above the valley, we continue along our circuit today, passing the Col de la Forclaz and then heading downhill to Trient. Approximate hiking duration is 5hrs. 750m - 2460ft ascent, 950m - 3117ft descent. Head back towards the Chamonix Valley and out of Switzerland. Walk uphill through a large forest and then open alpine slopes to the Col de Balme. Trek the last downhill stretch to Montroc in the Chamonix Valley to wrap up this unforgettable trek. Approximate hiking duration is 5hrs. 900m - 2952ft ascent, 750m - 2460ft descent. Local bus, walking, cable car. Experience the rarified air of Europe as you trek the Alps from France to Italy and Switzerland along the Tour du Mont Blanc. This challenging hiking circuit will reward you with mesmerizing views of glaciers, steep valleys, and, of course, Mont Blanc itself. Travel across high passes and through Alpine meadows, recharging at night with delicious mountain cuisine in simple refuges. Challenge yourself to conquer one of the world's premier hiking routes, uncovering the alpine heart of Europe on this incredible active adventure. 1. Please note that this trip is rated Physical Grade 5 and is a backpacking trekking trip from start to finish. Passengers are required to carry their own packs and there are no support vehicles. It is possible to leave some gear at the hotel in Chamonix as the trip begins and ends here. Night stops and routes may vary depending on weather conditions, daily group progress and availability. Flexibility is very important. Please see the equipment list for essential information on what to take. Please note that on most days there is no possibility of continuing by public transport; taxis may sometimes be possible if you are not able to continue walking but these cannot be guaranteed and will be at your own expense. 3. 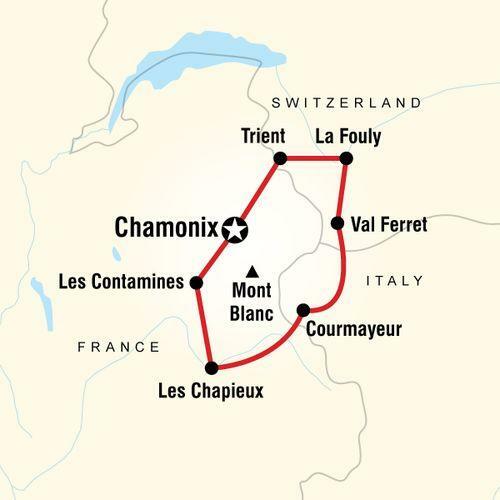 Please note that the Hotel Chamonix is affiliated with the nearby Hotel Crete Blanche and that in some cases the group could be divided between the two hotels. Eating is a big part of traveling. Travelling with G Adventures you experience the vast array of wonderful food that is available out in the world. Generally meals are not included in the trip price when there is a choice of eating options, to give you the maximum flexibility in deciding where, what and with whom to eat. It also gives you more budgeting flexibility, though generally food is cheap. Our groups tend to eat together to enable you to taste a larger variety of dishes and enjoy each other's company. The above information applies to G Adventures group trips. For all trips please refer to the meals included and budget information for included meals and meal budgets.